Keep corrosive materials out of the way. Our corrosive storage cabinets are the ideal solution for safe and secure storage of corrosive chemicals, such as acids, alkalis, caustics, sodium hydroxide solution and hypochlorite solution. Whatever volume of liquid you need to store, our range of corrosive safety cabinets has it covered. Choose from cabinets for as little as 15 litres up to 250 litres. We supply countertop or under bench corrosive safety storage cabinets, as well as cabinets suitable for indoor or outdoor use. 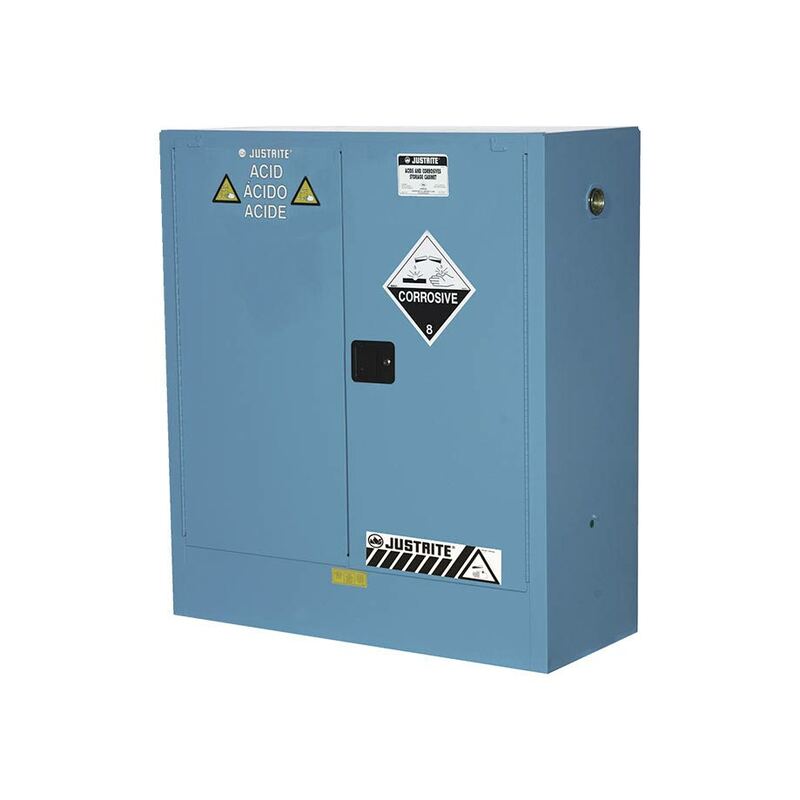 Our heavy duty corrosive safety storage cabinets are available in polyurethane or metal. Polyurethane cabinets are manufactured from polyethylene plastic material which provides superior resistance for the storage of corrosive chemicals which are highly aggressive to metal. These include chemicals such as Sulphuric Acid, Hydrochloric Acid, Nitric Acid and more. Both metal and polyurethane indoor corrosive safety storage cabinets are fully compliant with AS 3780 “The Storage and Handling of Corrosive Substances”, giving added peace of mind. Protect your employees and workplace from harsh corrosives. Our corrosive substances safety storage cabinets provide safe, secure storage of corrosives and meet the relevant Australian Standards. Got questions about corrosive substance safety storage cabinets? See the answers below or speak to our expert team. What is a corrosive storage cabinet? 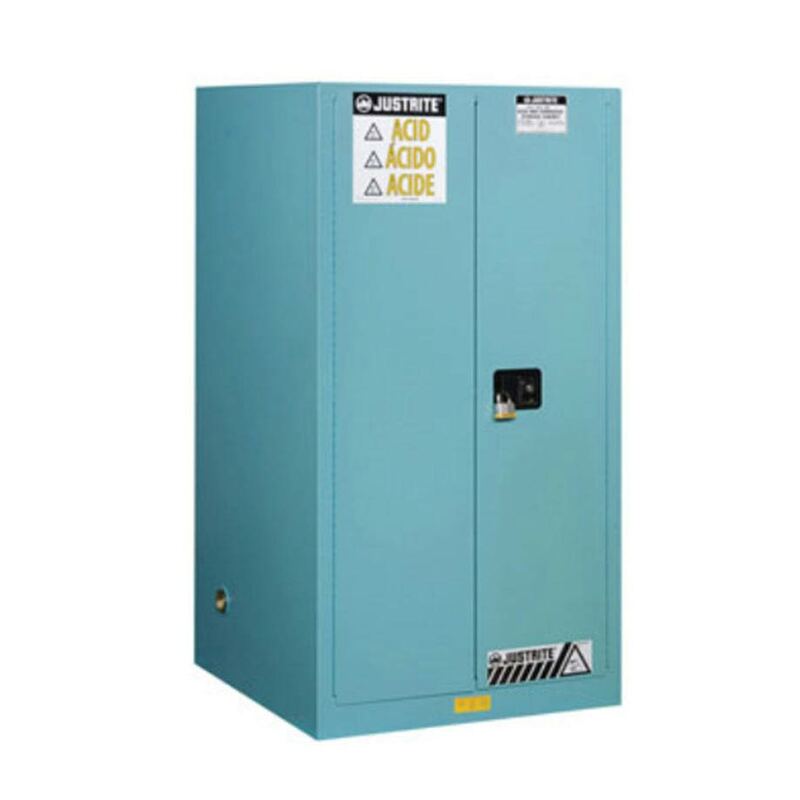 A corrosive safety storage cabinet is designed specifically for the storage of corrosive substances in liquid or solid form, as classified by the United Nations criteria and the ADG Code for Dangerous Goods. These include chemicals such as Acids, Alkalis, Caustics, Sodium Hydroxide Solution, Hypochlorite Solution and more. These cabinets are designed for the safe storage of corrosives in sealed and closed containers. What size and type of corrosive safety cabinet can I purchase? We supply a range of small corrosive safety storage cabinets, which store from as little as 15 litres up to 60 litres. 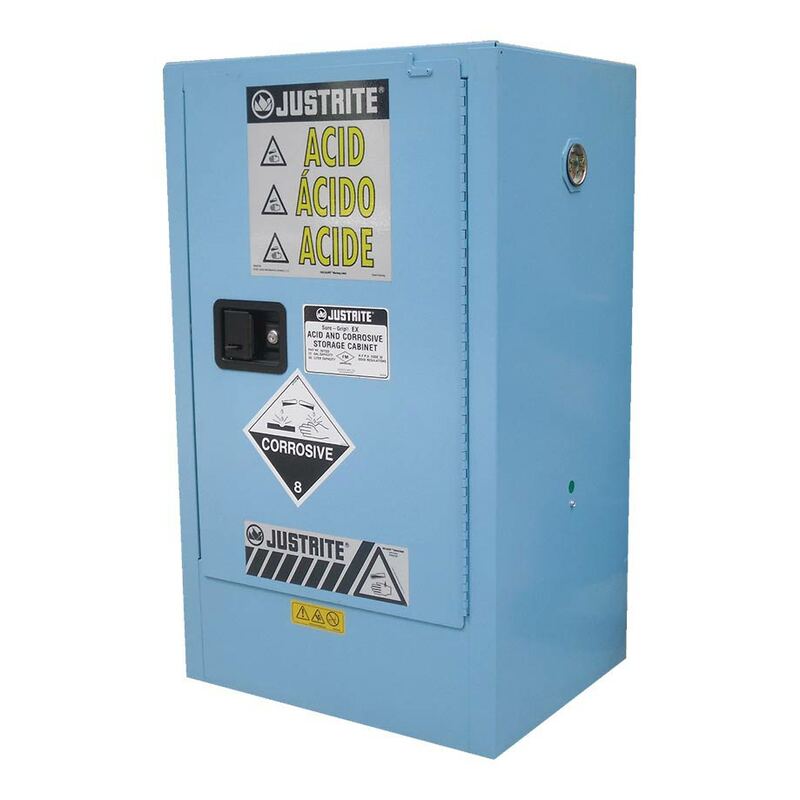 For example, our small corrosive storage cabinet is ideal for countertop storage of corrosive acids. If you’re looking for a large corrosive storage cabinet, select from our 100-litre, 160-litre and 250-litre options. We also offer an under bench corrosive storage cabinet for added convenience. Are your corrosive material safety storage cabinets compliant with Australian Standards? Yes. Each of our corrosive safety storage cabinets complies with the relevant Australian Standard: AS 3780 "The Storage and Handling of Corrosive Substances". Refer to the respective Standards for further specifications and conditions of use. Do you supply outdoor corrosive safety storage cabinets? At iQSafety, we’re proud to offer the highest quality corrosive storage cabinets to businesses around the country. Wherever you’re based - including Melbourne, Sydney, Canberra, Brisbane, Darwin, Perth, Adelaide, Hobart and everywhere in-between - we’re confident we have the spill kits and absorbent products to ensure you’re prepared for any situation.